FINNISH driving prodigy Esapekka Lappi has secured an incredible maiden victory in the FIA World Rally Championship on his home event home, Neste Rally Finland. 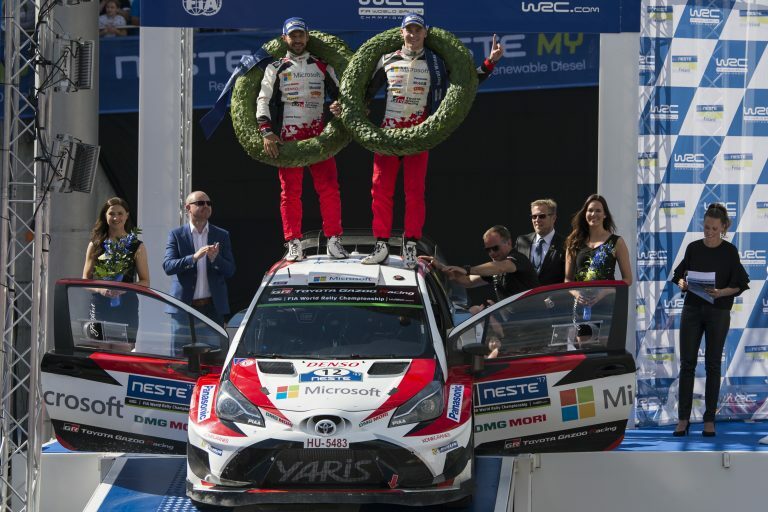 Driving a World Rally Car at the elite level for only the fourth time, the 26-year-old and co-driver Janne Ferm provided their Finnish-based Toyota Gazoo team with a sweet home victory in front of tens of thousands of wildly-cheering countrymen. Lappi spent much of the four-day rally battling his vastly more experienced teammate Jari-Matti Latvala, who was leading on Saturday afternoon when his car’s engine management computer failed, forcing him to retire for the day and dashing hopes of a fourth Neste Rally Finland win. This gave Lappi a comfortable advantage, although there was still a scare on the final morning when he damaged a wheel on the penultimate stage. However, he was able to replace it and reach the finish with a winning margin of 36 seconds. “Amazing, amazing”, said Lappi, who follows in the tracks of generations of Flying Finns in the rally world. Lappi will be one of the stars when the WRC closes its season at Kennards Hire Rally Australia on the NSW Coffs Coast on 16-19 November. He clinched the WRC2 support championship at last year’s event. Teemu Suninen had been on course to make it a one-two finish for Finland’s WRC rookies, but a high-speed spin one stage from the end dropped him to fourth. Nonetheless, it was a hugely impressive performance from Suninen in only his second start at the highest level. His mistake came during a tight battle for second with another Finn, Lappi’s teammate Juho Hänninen, and Welshman Elfyn Evans. The final morning began with Hänninen moving level with Suninen on the first stage, Lempää, only for him to fall behind Evans on the first pass of Oittila. On the repeat of Lempää, Hänninen fought back with the joint fastest time to climb to second, only for Evans to get back ahead on the final stage. Hänninen settled for third and his first podium, ensuring a double celebration for Toyota. Craig Breen finished fifth for Citroën ahead of Thierry Neuville, who struggled for pace all weekend in his Hyundai. With bonus points earned for third place on the rally-ending Power Stage, Neuville moved to equal-first with Sébastien Ogier in the drivers’ championship standings. Ogier crashed on Friday morning and was unable to restart due to concussion suffered by his co-driver Julien Ingrassia. Ott Tänak, who lost time to a puncture on Friday, finished seventh in front of Kris Meeke, Dani Sordo and Mads Østberg.